What a pleasure it is to virtually visit this kitchen. Soft finishes and colors—the cabinets are brushed steel, the palette hinges on charcoal rather than full-on black—lend atmosphere to the room. 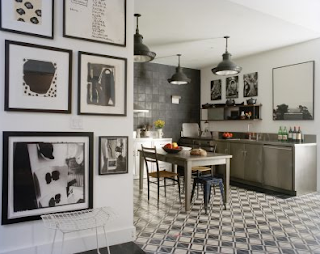 I love the pairing of the patterned encaustic floor and the graphite-tiled wall: it's a great play of texture and geometry. In the case of the lights, three are better than one, as the multiple disperses but doesn't diminish the impact of the quirky fixtures.